It has been a battle to get this recipe up on my blog today. If you didn’t know some wonderful food bloggers declared today Pie Day and are having a Pie Party by posting……….you guessed it pie recipes to their blog. I had planned to make this recipe for the 4th of July dessert but a delay in the morning threw me off my oven schedule and by the time the oven was free, so I could bake my crust I was so worn out from cooking all day I said forget it. I planned to make the pie today since I had already made the filling yesterday morning. I could have avoided all this stress had I just went and bought a pre made graham cracker crust from the grocery store but the pie puritan in me wouldn’t let me. Any way my pie crust recipe is one from The Pioneer Woman’s cook book and it is so good I will never make another baked pie crust recipe again. This recipe is it! I have make it about 8 times since I first found it and it rocks! Now on to the recipe! 1 deep dish baked pie shell or a graham cracker crust would also work nicely with this recipe. Combine sugar and cornstarch in a heavy pot. Whisk with a whisk to fully incorporate the cornstarch with the sugar. Add to the pot the milk, butter, lemon zest, lemon juice, egg yolks and cinnamon. Mix with the whisk. Turn the fire on under the pot to a low medium until the butter melts. Once the butter melts turn the fire up to medium and whisk constantly until the filling is thick and smooth. FYI It will never be completely smooth because you have the lemon zest in there. Pour filling into a bowl and allow it to cool on the counter. Once the filling is almost completely cool cover the bowl and put it in the refrigerator to chill. 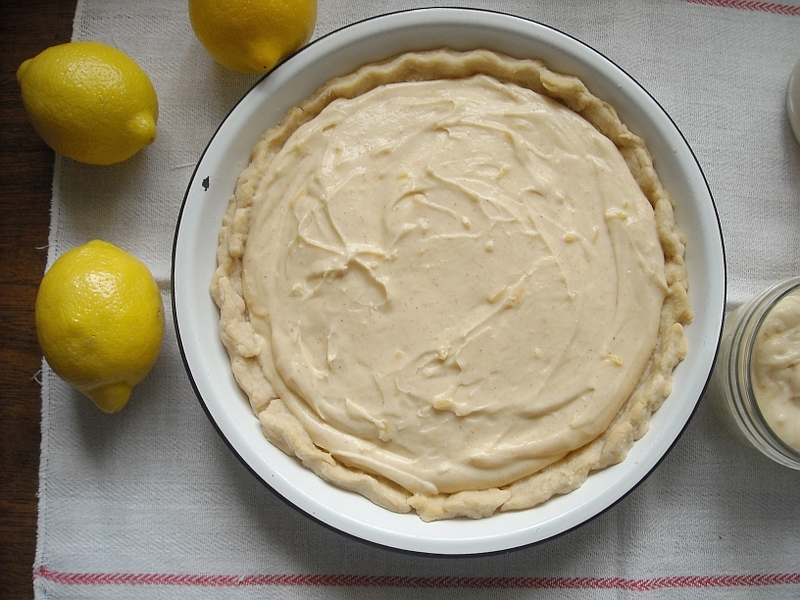 Prepare your pie crust while the filling is cooling. If baking a pie crust you will have to allow it to cool before filling. 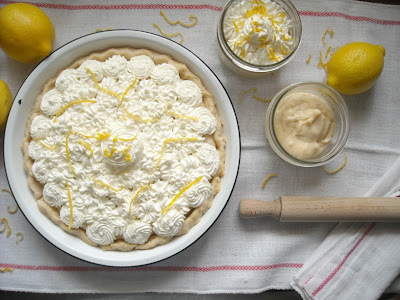 Remove the filling from the refrigerator and fold the 1 ¼ cup of crème fraiche and 1 teaspoon of almond extract into the lemon pie filling. Gently fold until the crème fraiche is completely mixed in to the filling. Pour the filling into the pie crust and chill for about 2 hours. One change I would make to this recipe is to leave out the cinnamon in the filling. 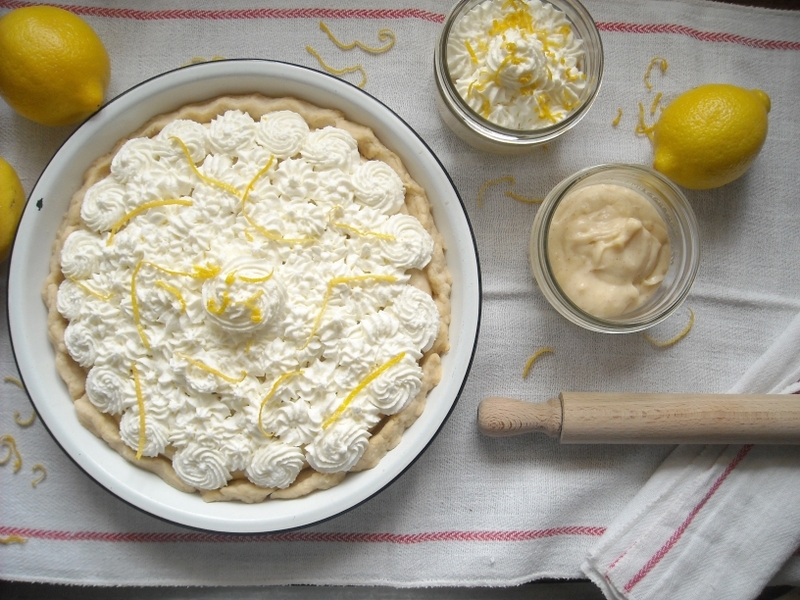 The tangy flavor of the lemon and crème fraiche work wonderfully together. I don’t think it needs the cinnamon in this version of the recipe. But if you like cinnamon feel free to add it. It tastes great with the cinnamon. For my tastes I could do with out it. The original recipe called for sour cream and the cinnamon might have added a little extra something but I don’t think the complex flavors of the crème fraiche need it. Add the heavy whipping cream, almond extract and sugar to a large bowl. Beat with a mixer until very thick. Gently fold the crème fraiche into the whipped cream. n top of the pie or pipe with a star tip. What to do with extra filling? The pie crust I made was a little small so I ended up with about 1 cup of filling left over. I filled a couple of small mason jars half full of filling and piped some whipped cream on top. 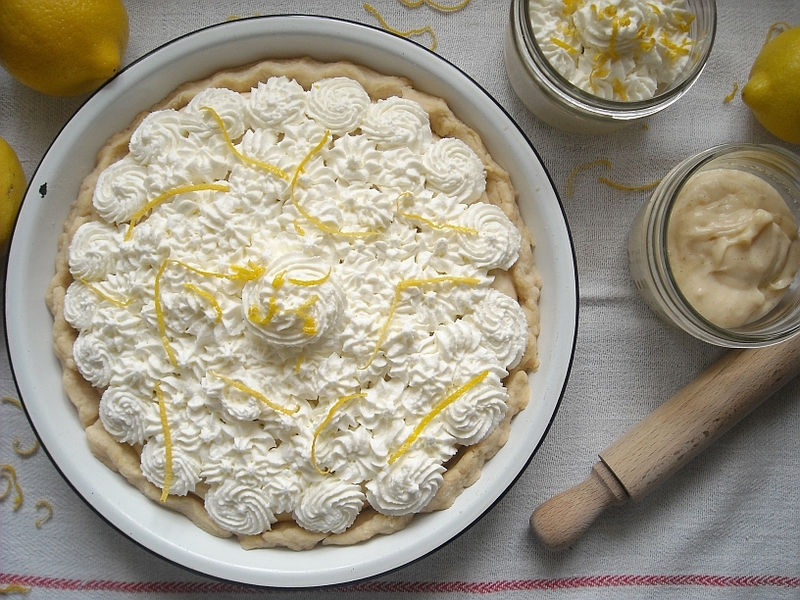 This would be perfect for a picnic or beach dessert. I have bookmarked this recipe, this looks awesome! 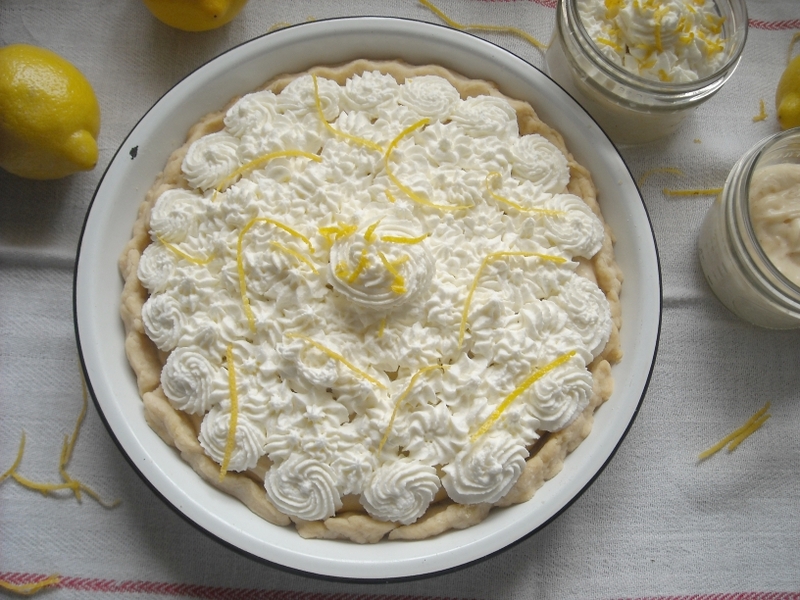 I love lemons and this pie really puts them to good use. 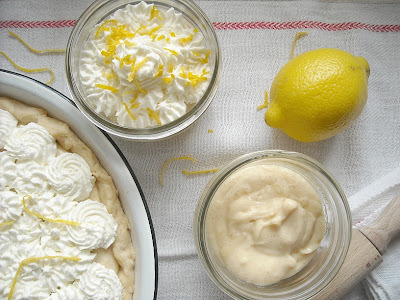 Cool idea-lemon pie in a jar. Thanks for sharing. Wow…that pie sounds fantabulous!!! I wish I had known it was Pie Day! what a gorgeous pie!! I would love a slice or two of that refreshing lemon pie, and how did I miss pie day!! I missed pie day too. 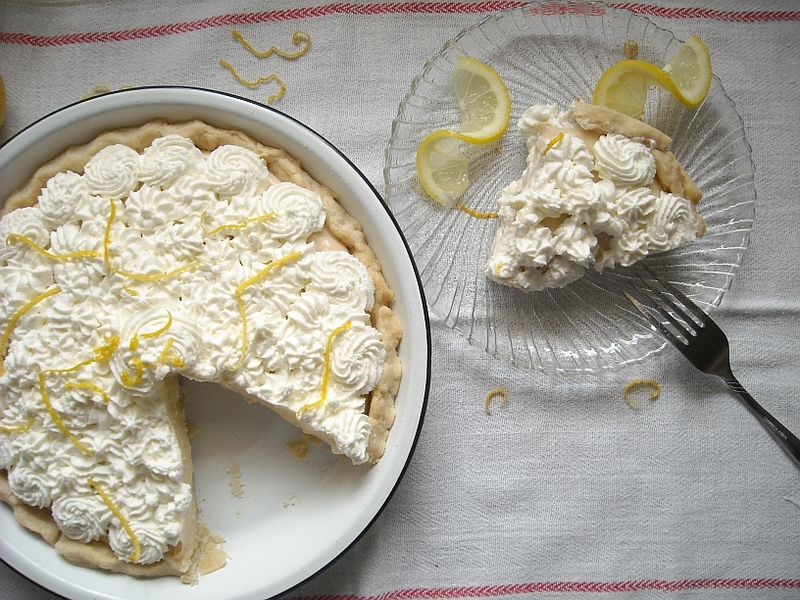 I will have to cheer myself up with a slice of your fantastic looking lemon pie. Yum, Happy Pie Day indeed. I've never had creme fraiche in a pie before, but it sounds really good. And good for the Pie Puritan in you!